One of the best books I read last year wasn’t really a book at all, but a graphic novel called Marbles:Mania, Depression, Michelangelo, and Me. 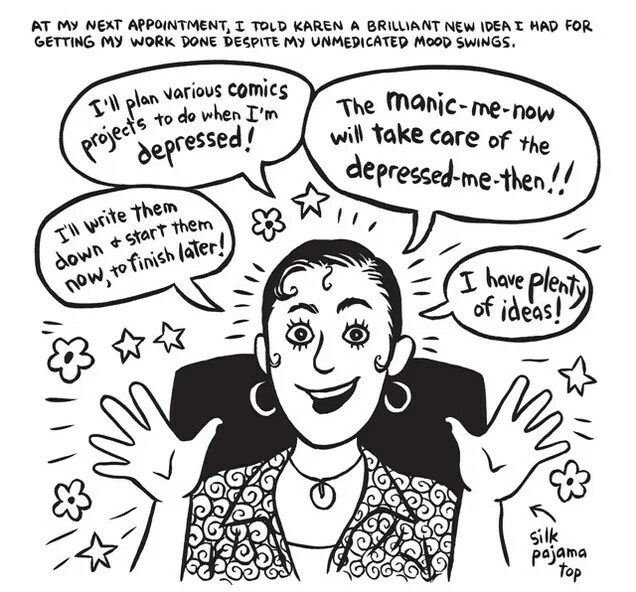 It was created Ellen Forney, a cartoonist by trade diagnosed with Bipolar disorder. Forney shares her experiences, from pre-diagnosis symptoms and wrestling with being labeled, to medication struggles and her innermost fears and reflections. Despite having several years of training in understanding Bipolar disorder, I came away from this read feeling more informed, understanding, and empathic. So I was very excited to see that Marbles made i09’s “10 Comics That Can Help You Understand Mental Illness.” I think there’s something powerful about taking the often invisible pain and confusion of mental illness and making it manifest. Comics tackling difficult issues is nothing new – just take a look at Comicspedia. Comics are a safe, familiar foundation for exploring and sharing experiences that can be scary and alien. Comics are also less intimidating than a journal article or text book. When trying to help clients or their support network understanding what is happening, handing over a graphic novel might get you some weird looks, but also might create accessibility and openness. I would wager a comic is more likely to be read and easier to share and discuss compared to an academic piece, but that is just my opinion. I have shared Marbles with friends and family, and the Hyperbole and a Half piece is one of my favorite comics. I have not read the others on the list, but I certainly intend to. Here’s to starting 2015’s reading list with comic books!